The VHA manages the largest medical system in the United providing care to over 8 million veterans, employing 180,000 medical personnel and operating 163 hospitals, over 800 clinics, and 135 nursing homes throughoughout the continental U.S., Alaska, and Hawaii on a single electronic healthcare information network. Nearly 25% of the nation's population is potentially eligible for VA benefits and services because they are veterans, family members, or survivors of veterans. The Department of Veterans Affairs (VA) has had automated data processing systems, including extensive clinical and administrative capabilities, within its medical facilities since before 1985. Initially called the Decentralized Hospital Computer Program (DHCP) information system, DHCP was enshrined as a recipient of the Computerworld Smithsonian Award for best use of Information Technology in Medicine in 1995. VistA supports both ambulatory and inpatient care, and includes several significant enhancements to the original DHCP system. 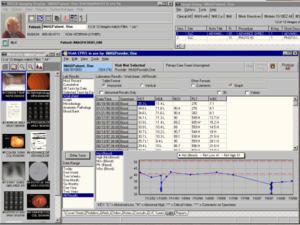 The most significant is a graphical user interface for clinicians known as the Computerized Patient Record System (CPRS), which was released in 1997. In addition, VistA includes computerized order entry, bar code medication administration, electronic prescribing, and clinical guidelines. CPRS provides a client–server interface that allows health care providers to review and update a patient's electronic medical record. This includes the ability to place orders, including those for medications, special procedures, X-rays, nursing interventions, diets, and laboratory tests. CPRS provides flexibility in a wide variety of settings so that a consistent, event-driven, Windows-style interface is presented to a broad spectrum of health care workers. VA hospitals using VistA are one of only thirteen hospital systems that have achieved the qualifications for HIMSS stage 7, the highest level of electronic health record integration,while a non-VA hospital using VistA is one of only 42 US hospitals that has achieved HIMSS stage 6. M2Web is an open source web gateway to MUMPS for use with VistA. A free open source module from M/Gateway called MGWSI has been developed to act as a gateway between GT.M, Cache, or M21 MUMPS databases and programming tools such as PHP, ASP.NET, or Java, in order to create a web-based interface. VistA Imaging has been made freely available in the public domain for private/public hospital use through the Freedom of Information Act. It is available through the Department of Veteran's Affairs software request office. (Licensing of several proprietary modules are required for it to function correctly. VistA Web collectively describes a set of protocols that in 2007 was being developed and used by the VHA to transfer data (from VistA) between hospitals and clinics within the pilot project. This is the first effort to view a single patient record so that VistA becomes truly interoperable among the more than 128 sites running VistA today. BHIE enables real-time sharing of electronic health information between DoD and VA for shared patients of allergy, outpatient pharmacy, demographic, laboratory, and radiology data. This became a priority during the Second Iraq War, when a concern for the transition of healthcare for soldiers as they transferred from active military status to veteran status became a national focus of attention. A Clinical Data Repository/ Health Data Repository (CHDR) allows interoperability between the DoD's Clinical Data Repository (CDR) & the VA's Health Data Repository (HDR). Bidirectional real time exchange of computable pharmacy, allergy, demographic and laboratory data occurred in phase 1. Phase 2 involved additional drug–drug interaction and allergy checking. Initial deployment of the system was completed in March 2007 at the El Paso, Augusta, Pensacola, Puget Sound, Chicago, San Diego, and Las Vegas facilities. The combination of VistA and the interoperable projects listed above in the VA/DoD systems will continue to expand to meet the objectives that all citizens will have an electronic record by 2014. Because of the success of these programs, a national move to standardize healthcare data transmission across the country was started. Text based information exchange is standardized using a protocol called HL7 (Health Level 7), which is approved by the American National Standards Institute. DICOM is an international image communications protocol standard. VistA is compliant with both. VistA has been interfaced with commercial off-the-shelf products, as well. Standards and protocols used by VA are consistent with current industry standards and include HL7, DICOM, and other protocols. Tools for CCR/CCD support have been developed for VistA, allowing VistA to communicate with other EHRs using these standardized information exchange protocols. This includes the Mirth open source cross platform HL7 interface and NHIN Connect, the open source health information exchange adaptor. In 2009, a project was undertaken to facilitate EHR communication between the VA (using VistA) and Kaiser Permanente (using Epic) using NHIN Connect. (Both VistA and the commercial EHR Epic use a derivative of the MUMPS database, thereby facilitating data exchange.) When completed, two of the largest medical record systems in the US will be able to exchange health data. Public-domain VistA derivatives are also expected to be able to use NHIN Connect. The VistA EHR has been used by the VA in combination with Telemedicine to provide surgical care to rural areas in Nebraska and Western Iowa over a 400,000-square-mile (1,000,000 km2) area. This was done by the US government in an effort to make VistA available as a low cost Electronic Health Record (EHR) for non-governmental hospitals and other healthcare entities. With funding from The Pacific Telehealth & Technology Hui, the Hui 7 produced a version of VistA that ran on GT.M in a Linux operating system, and that was suitable for use in private settings. VistA has since been adopted by companies such as Blue Cliff, DSS, Inc., Medsphere, and Sequence Managers Software to a variety of environments, from individual practices to clinics to hospitals, to regional healthcare co-ordination between far-flung islands. In addition, VistA has been adopted within similar provider environments worldwide. Universities, such as UC Davis and Texas Tech implemented these systems. A non-profit organization, WorldVistA, has also been established to extend and collaboratively improve the VistA electronic health record and health information system for use outside of its original setting. VistA (and other derivative EMR/EHR systems) can be interfaced with healthcare databases not initially used by the VA system, including billing software, lab databases, and image databases (radiology, for example). VistA implementations have been deployed (or are currently being deployed) in non-VA healthcare facilities in Texas, Arizona, Florida, Hawaii, New Jersey, Oklahoma, West Virginia, California, New York, and Washington, D.C.